From weight loss interventions and parental decisions to the psychology of alien abduction, the latest issue of The New School Psychology Bulletin runs a gamut of recent graduate student research in psychology. Founded in 2003, this student-run and peer-reviewed publication at The New School for Social Research has become an important forum for psychological work produced by emerging scholars in the field. It also serves as a valuable training ground in the practice of writing, submitting, reviewing, and editing journal articles. “This is a learning experience, not only for the people who submit, but also for the reviewers and for the editors,” said Jessica Engelbrecht, who served with students Mariah HallBilsback and Emily Maple on the current three-member editorial board. The board is comprised of doctoral students in the Department of Psychology, but The Bulletin's contributors come from departments across the United States and around the world. Whereas other peer-reviewed journals similarly welcome the work of young scholars - these are often called “learning journals” in the field - the Bulletin is one of only two graduate psychology journals run entirely for and by students. According to the editors, students drove the publication from the beginning. They identified a need to develop facility with the entire publication process, while also creating a space to test new ideas and showcase the best new research to broad audiences outside of The New School. “Within the Psychology Department, students just felt that there was a need for it,” said HallBilsback. This training helps students to develop ideas, while also building diverse professional and scholarly skills. These include not just teaching, writing, and conducting rigorous research, but also presenting one's ideas in a compelling way, corresponding with academics across sub-fields, developing networks, and participating actively in the review and editorial process. The Bulletin typically publishes semi-annual editions, varying in size depending on the number and quality of submissions. 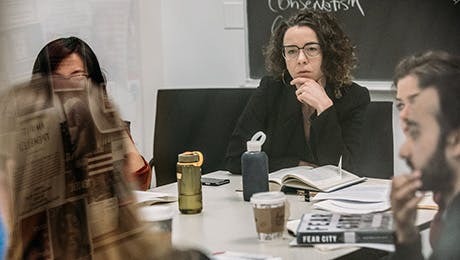 It gives students at The New School for Social Research a distinct and productive opportunity to work with students from other labs, creating links across units in the department. A particular advantage for NSSR Psychology students is that the Bulletin offers a collaborative environment in which to meet and collaborate with peers in the MA and PhD programs. This is especially true for the volunteer reviewers, who are brought together periodically to receive (or refresh) their training. “The Bulletin offers a nice chance to meet people outside of one's lab in a non-competitive setting,” said Engelbrecht, “It's one of the few times you can interact in a communal way with your colleagues.” In this sense, like other student-run groups at The New School for Social Research, the Bulletin provides both a forum for both rigorous collaborative research and an opportunity to socialize. Ultimately, the editors enforce the same disciplinary and professional standards that characterize the review process at other journals. The Bulletin is also listed on Google Scholar and the standard scholarly psychology databases, meaning the journal positions research to the scholarly psychological community at large. To maximize exposure for students, the Bulletin makes available its current issue-as well as its entire back catalogue-online. In some ways, the average experience of authors - in terms of individual attention and intensity of review - intends to go above and beyond what might be expected in other venues. For example, regardless of whether a submission goes on to publication, each author receives detailed editorial feedback, including engaged suggestions on how the work can be improved. In other words, there is no chance of receiving a boilerplate rejection when submitting to the Bulletin and every submission becomes a learning experience. When asked about what recent articles they found most memorable, the editors offered two examples. The first is an article that maps the ways a certain kind of Buddhist meditation can alter the brain's chemistry. The second, found in the current issue, is the aforementioned piece on the fascinating psychology of individuals who claim to have been abducted by aliens. Happy reading! Read the latest issue of The New School Psychology Bulletin and learn more about the Department of Psychology at The New School for Social Research.